LA Times Second Annual Food Bowl lasts until the end of May. This 'Plant Power No Beast' event curated by Pulitzer Prize winning Jonathan Gold brought together 20 of the world's most exciting women chefs in his opinion. It was this event he said he had been most looking forward to and hung around to the end dining and socializing to prove it. 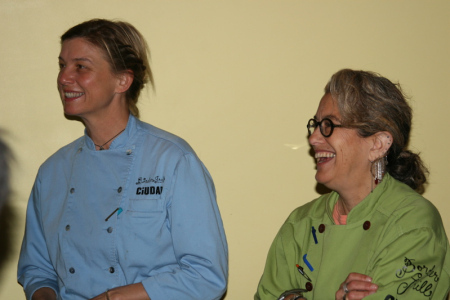 Hosted by long time restaurant partners who are making it in a man's world are entrepreneurial chefs Mary Sue Milliken and Susan Feniger of the venerable Border Grill. It was their modern Mexican take on a fresh blue corn tamale topped with guacamole, creme fraiche and pico de gallo which helped to expand my palate in the 1980's. Milliken and Feniger a few years ago still going strong disrupting the status quo. Founding members of the OG Golden Uterus Club of Multi-Culti Veggie Focused cusine, Milliken and Feniger still lead a fresh food focused movement and way of life they helped to found. Their moment in the sun is for today and a baton for the next generations to come. The night held promise as governors of the kitchen strutted their stuff with signature plant based dishes. All produce was supplied by Frieda's Specialty Produce with the eponymous 94 year old visionary disrupter extraordinaire alive and well. "Fear No Fruit," (2005) the documentary explains how Rappaport-Caplan introduced chefs to tropical and semi-tropical fruits such as kiwis and specialty items common in the cuisines of less developed economies such as jicama from Guatemela. Founder Dr. Frieda Rapoport Caplan, at the center of it all and daughter Karen Caplan, CEO, right. "Pass the kale," could be the family motto of this matrilineal busines in its third generation. Who traveled the furthest to participate? It's a tie between rising star who needs a cookbook Monique Fiso of New Zealand's, Hiakai, revivifying Maori cuisine with "beans are my new obsession," Nadine Levy Redzepi co-owner of Noma. With René Redzepi her chef husband, she is a new cookbook author of Downtime: Deliciousness at Home. Levy Redzepi runs the business of redefining Nordic cuisine and is the chief cook for the family with three daughters under 10. One of Nadine's favorite recipes from her childhood is a Portugese chicken liver ragout recipe she deployed to impress and woo her husband many moons ago. The other 17 chefs have restaurants within a 10 mile radius emanating from the femme centric Coral Tree Plaza location of Border Grill and Frieda's warehouse. One could argue that LA being a mecca for vegan at the moment, availability of Freida's produce ushered in plant locus food trends such as World Cuisine and Street Food over the last 30 years they've been in business. The sky's the limit in terms of what these chefs can pull out virtually from thin air and nutrient rich soil. As the evening ended with desert I am going to work in reverse order from the last to first items sampled for various shout outs. In addition to Stan Gordon above, best helpful husband club includes Nick Roberts of Playa Provisions and Alan Schulman of Akasha. Proof that sistahs do it for themselves while making room for their male partners to fully materialize the dream. What says 'summer' best is waiting in line for a burger Pea protein burgers with shitake bacon by Brooke Williamson of Playa Provisions cooking with husband Nick and son Hudson Roberts. Best in Heat Thai green curry by Jazz Singsanong of legendary Jitlada busy cooking. Pictured above serving are daughter Sariya Singsanong, and neice Sugar Sungkamee, whose late father Tui opened this Southern Thai restaurant with Jazz. Best in Re-imagined Sweet Potatoes - a Tie Kismet is their second west coast career reboot for native Brooklynite's Sara Kramer and Sarah Hymanson with their first project a high concept falafel stand called Madcapra still in operation at LA's Grand Central Market. Ms. Fiso of NZ as aforementioned reported she broke two Vitamixes on the salsa verde that topped her mind blowing golden tubers. The delectable product of all that hard work. Best in Peas and Carrots Dumpling with Pickled Cauliflower Shirley Chung of Ms. Chi with Breyon a recipient of Girls Inc. after school empowerment programs. Best in Fermented Sauce for Grilled Veggies April Bloomfield's recipe from Hearth and Hound being tended to. No comment on the outstanding secret ingredients for her fermented tomatoey goodness atop the charred orange (can you believe it?) Broccolo Romanesco. Best in Savory Snack Chaat, an Indian road side hors d'oeuvre, by Akasha Richmond yogini turned chef of Akasha served by her business partner and husband Alan Schulman. Arguably in a league of her own, Dominique Crenn, presence as absence noted. Best wines of the evening Holus Bolus Syrah 2015 with musty authentic minerality from Black Sheep Finds in nearby Lompoc near Santa Barbara, CA. Did they by any chance share their recipes @Tara Fass, LMFT ? Not exactly though several do have cookbooks for sale! Looks so fun. I really need to take cooking classes. Thanks for the inspiration! You are welcome. Cooking is part therapy for me personally. Martha Walson and 8 others upvoted this.